Removable wallpaper is a great idea for an accent wall. The Pivotal single-handle bath faucet serves as a beautiful centerpiece for the vanity. With warm weather knocking at the door, it’s time to rejuvenate your spaces and rid the home of winter clutter. While it may be the perfect time of year for a refresh, it can be challenging to find exciting new ways to decorate. With top design trends in mind, here are four simple solutions to spring into a new look this season. To entertain the eye, coordinate mixed materials and beautiful textures in unexpected ways. From a warm Champagne Bronze finish juxtaposed against matte white tiles, to espresso-stained wood contrasted with clean marble, this trend is all about bringing the unexpected together to create a unified design aesthetic. Quick refreshes to any room can include accessories such as modern paintings or wall planters and potted succulents. These quick additions serve as simple ways to complement what is already in the room, eliminating the need for a full redesign. In an increasingly connected society, incorporating design inspiration from around the globe has become an ever-present trend that is sure to make an impact. Influenced by the most cosmopolitan cities around the world, the Pivotal single handle bath faucet serves as a beautiful centerpiece for the vanity. With clean lines and contemporary form, this collection is perfectly suited for all generations and all style preferences – from millennial to baby boomer. 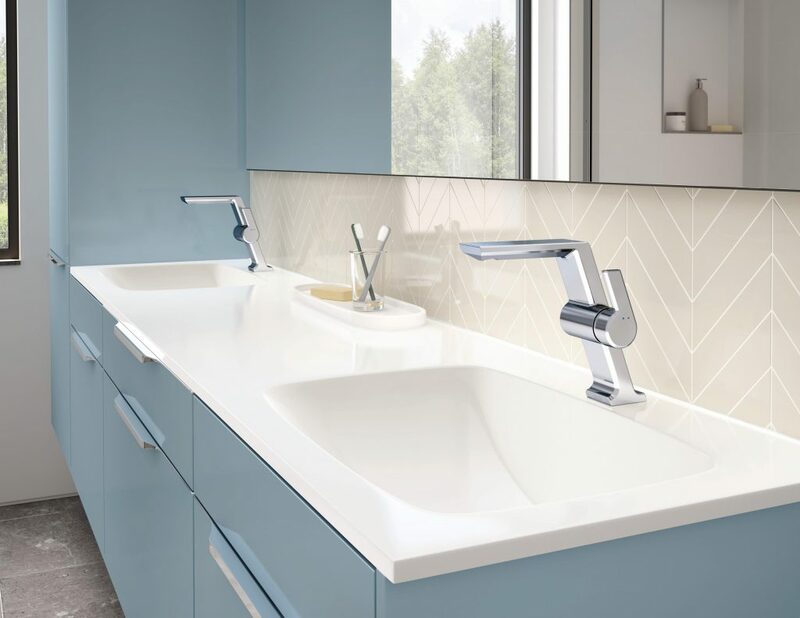 While simple in design, Pivotal makes a bold, modern statement with its sleek handles and angular spout. To further amplify the contemporary aesthetic, focus on simplicity by installing mirrored cabinets to store toiletries. For a more traditional look, pair a stainless faucet finish with warm cabinetry such as toasted almond oak. For people who choose to rent instead of purchase, creating the warm, comfortable environment we all know and love can be a challenge. Removable wallpaper is a great way to implement a design refresh and make a temporary space feel like home. The beauty lies within the name – it’s removable. Intricate designs and lively patterns are now easily accessible; perfect for an accent wall that needs a pop of color. If you yearn for a new design, simply remove the existing paper and replace with a new pattern. This spring, channel your inner artist and incorporate a sense of vibrancy into living spaces. Jeweled tones are experiencing a resurgence this year, proving there is no better way to energize a space than with a brilliant emerald green or a lively turquoise accent. If the idea of painting a room is too daunting, opt for smaller updates that bring a punch of color. Thrift stores are great places to find unique accessories or that perfect piece of furniture, such as an ottoman or tufted bench that can be re-covered with a rich magenta or sapphire blue fabric. These easy art projects serve as a great afternoon project that can refresh a neutral space.